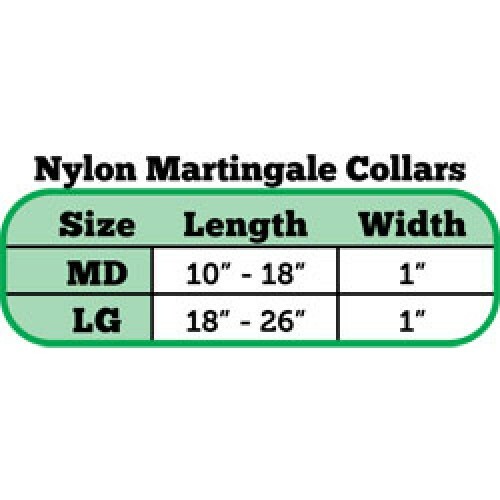 Martingale style collars are meant to be used for walking, to ensure that you have better control than you would with a standard buckle collar, while providing your dog with a more comfortable alternative to a choke collar. 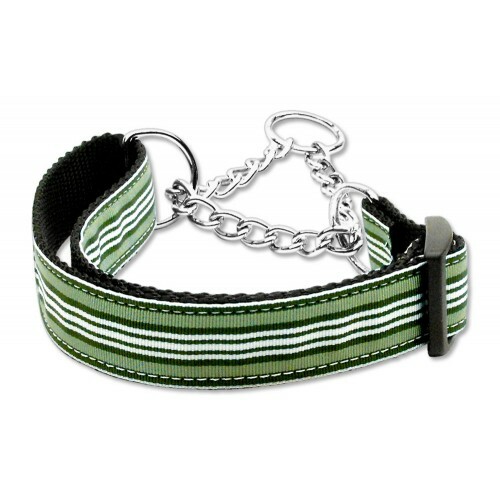 This collar is 1" wide and is made of sturdy nylon webbing with a popular preppy stripes pattern ribbon overlay in green and white colors with shiny chrome hardware anda sturdy black plastic tri-glide adjustment slide.It comes with attached Mirage Pet Products hang card.Large will adjust to fit a neck size from 18-26". Matching leashes are available; check store listings. Made in the USA. ** Consult size chart before ordering to avoid returns.